Disney is planning to shut down the Virtual Magic Kingdom -- an online world around which thousands of people have made online friends and fortunes. Help Support this Site. Many gamers take nootropics to help them get an edge. Noopept is considered one of the best nootropics on the market. Learn more about Noopept and it's effects from this noopept review here. "We hereby respectfully request that Disney please keep the 'magic' that is the Virtual Magic Kingdom alive, open, and available to all." *note: if you are under 13, please get your parents permission before signing this petition, or ask them to do it for you. This petition will be sent to Disney officials. Comments will be included, and will also be sent to the media. By posting on this site, you agree to this. If you don't want your name or comments sent to Disney or the media, please let us know. First, the official trailer for Twilight: New Moon is available now. It looks so awesome! At Virtual Family Kingdom, Space Age is now open! Laser tag, cool new space clothes, Alien Enchantment, and more are now available!!! Come visit your friends at VFK! See you there!! VMK Unleashed is now said to have been a long-running scam to collect ad traffic revenue, with little or nothing going on behind the scenes. I am not sure about that, but regardless, it isn't opening. Some other sites are now claiming that they are going to what VMK Unleashed said they were going to do, but at this point, it seems like those may be scams, too. Lots of anger and frustration all around. What a sad and pathetic thing to happen to Disney's once-greatest game ever. If fans were actually rebuilding VMK it would be one thing, but Disney should not be allowing their trademarks to be used in illegal scams. They have people working day and night enforcing their copyrights all over the Internet; why are they asleep at the switch on these scams? Second, VMK Unleashed - which was supposed to open a revised version of VMK on servers around the world this weekend -- is gone. The young team working on it posted a message for a short while on their website, and a few hours later took the entire site down, including their forums. The message said something about how they weren't pulling together, spending too much time on the forums, etc., and eventually got into a fight as they realized they wouldn't meet their deadline. Reportedly someone on the team deleted everything they had worked on so far... So, at this point it looks like VMK Unleashed will never launch. The first good news is that Virtual Family Kingdom has posted a big new update for their first anniversary celebration, with the whole game software and toolbar redesigned, even easier to use, and faster. They have tons of new things on their site. Space Age will launch next Sunday, and you can see a picture of it on the new welcome animation on the homepage. They will have balls, scavenger hunts, and other contests all week long... Check it out! The second good news is thanks to everyone for visiting Show and Know our new website where kids can post school assignments or whatever, free! Show what you know! Together, my family and I are making a new Web site, called Watch FamilyTV. It has fun videos from all over the Internet that anyone in your family can watch. It's lots of fun, with many videos we found and like. You can suggest videos you like, and leave commments for others to read, too. I hope you will visit Watch FamilyTV! We don't know how to make a virtual world like VMK or VFK, but we can offer this, and hope you, your friends, and families will enjoy it! My family and I have been posting comments from all of you from the day after VMK announced it was closing through today, January 4, 2009. I am sorry but we can't continue to post your comments any longer (the spam we get through the form has gotten overwhelming!). We will leave your comments up to show people how we felt about Disney and Sulake closing down the Virtual Magic Kingdom. I wanted to thank everyone for their support, and for fighting to save VMK. No, I am very sorry, but at this point I don't think it ever will. Steve Wadsworth is in charge of Internet stuff for Disney and when he took over, he bascially said he closed VMK because they weren't making money from the site directly. That was his decision, and it appears he won't back down on this. I have noticed that many people are afraid to admit it when they make mistakes. Everybody makes mistakes -- even Miley knows that -- but not everyone is willing to admit it and then decide to do better in the future. Maybe if Mr. Wadsworth ever leaves Disney, things could be different, but, for now, Disney has no plans to re-open VMK. So, if they did decide to do it, they will publicize it over and over and over -- on television, magazines, the Internet, everwhere -- just like they did with other virtual worlds they have opened since. There are many, many signatures posted here and elsewhere asking Disney to please not close VMK. We sent the petition to many people at (or affiliated with) Disney (including Mr. Wadsworth). Many times. They never directly responded, perhaps because then they might be admitting they were making a mistake and would need to apologize. (see above). The only direct response we received was a phone call from a woman in the publicity area to correct a blog entry elsewhere that said Disney might one day re-open VMK. She very clearly said Disney would not re-open VMK, ever, at any time, in any way. That was the phone call. What about my friend ________? I miss them!!! 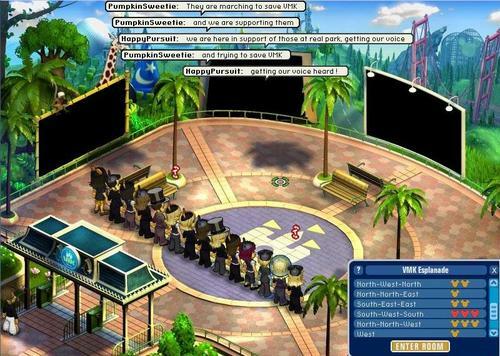 To everyone looking for their VMK friends, I hope that you find them on VirtualFamilyKingdom.com, a world made by people who didn't want to lose their VMK friends either. Thanks to VFK for helping me keep many of my friends, and for helping me to make lots of new ones! If you haven't been on VFK lately, then you don't know how awesome they are getting! Christmas was great -- just beautiful -- and they will be having another New Year's Ball later in January 2009. Space Age will be opening soon, along with lots more games. There's much more to say about VFK, but you have to see it to believe it. I hope to see you all on VFK! Comments: So, when I first join VMK, everytime I logged on, I got this feeling. Like happiness, joy, and excitement all in one. I don't know if there is a name for it. I was on VMK Revisited and I got the same feeling when I heard the "VMK Music" when you first open the map. Everytime I go on now, I close my eyes and remember that feeling. Well, some VMKers were hoping that VMK might re-open on October 24, 2008. I was going to check out the VMK homepage, and Disney took it down. Now you get sent somewhere else on their site. So, I think VMK is gone for good. "[VMK] was promotional. There was no business model attached to it." Looking back, it seems like what he meant was that since VMK didn't have a built-in "business model" -- a way to make money off of it already -- he decided it was "just a promotion." Thanks to everyone who has helped support this site, and your many thank-yous. It is really fun to see so many of you at Virtual Family Kingdom, which had a totally awesome Halloween, and it looks like there will be a very Merry Christmas, too. Hope to see you there! Will VMK re-open in October or in 2009? "Recently we've received inquiries asking if VMK is reopening -- there are no plans to reopen VMK in any form." And, true to how Disney has handled VMK's closure, there are no apologies of any kind, just a statement about how "Disney.com continues to create experiences to amaze our guests." To this, we agree: the experience we all shared of how Disney closed VMK without so much as an explanation or apology -- completely ignoring the protests of thousands of children -- was truly "amazing." Here is a great new site about VMK: We want our community back! A NOTE TO PARENTS: Did you move when you were young? Was it hard to adjust after the move? For many VMK players, they have also lost their entire social support system -- just like people who move. Keep talking with your children about their loss(es) with VMK closing. For many of us, it has been, is, and will be really hard for some time to come. We appreciate your love and support. 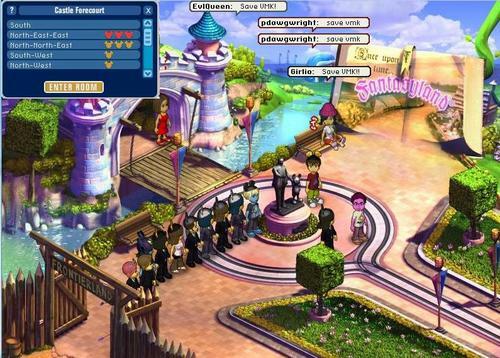 And remember, Virtual Family Kingdom is now available, and is where most of the same staff (who keep things safe for us all) and players have gone to continue our relationships. Thank you!! A new write-in campaign to Disney to ask they re-open VMK, called VMK1000, is now open here.And discontinue Disney buying. "This shows disney we want VMK back, and that we will speak with our money. "Just a suggestion. I am a former cast member and stock holder, and they have not treated us, the Disney Guest, correctly." "Disney�s decision to close VMK was a business decision - so it is difficult for me to assign a "should" factor to it. However, I do think it is enormously - enormously - unfortunate that Disney has provided such little support for this hugely engaged community in the closing. Disney has a perfect opportunity here to have strategically communicated with this community, helping them transition into one of the new Disney world perhaps or providing some way to somehow archive some of the personal artifacts - not the least of which are the avatars, assets and personal environments which users have spent untold hours building - maybe that would be simply a digital VMK memory scrapbook - something that communicated Disney was tuned into the angst of the community being disbanded.I do think any organization that actively builds a community has some responsibility to manage the dismantling of that community if it should be necessary. But, in the long view, any company that builds a community should be doing so as a long term commitment and ought to be considering at the outset what the "exit strategy" is." "There are rumors circulating about VMK possibly being extended (for long time users) for a few months longer. I can't confirm anything at this time, but keep your fingers crossed." Sasha wrote to suggest calling RadioDisney to complain. Thanks, Sasha. In the the OC Register article above, Linda Zimmer of MarCom:Interactive offers this important advice to parents, in answer to the question, "What do you suggest VMK people do when VMK ends? Why?" "Many will be migrating to Virtual Family Kingdom which is a site created to attract the VMK "homeless." This seems to be a place where people can at least gather and decide where to take their virtual socializing next. Groups do tend to migrate and bring a bit of the old world into the new. Parents should help kids with a plan to migrate to another safe, moderated online environment. But they shouldn't have children connect with virtual friends via email addresses or other personally identifiable information unless the parent is actively involved in making these connections "outside" the world. "I'd like to emphasize to parents of children who have been very active in VMK to keep close tabs on their child's emotional state in the months after VMK closes. These worlds are very immersive and very, very "real" to those who participate. Emotional connections develop quickly and deeply and disruption can cause real, actual grief in a child. Plus something the child has invested heavily in, something that may represent a type of personal identity, is suddenly unavailable. This is an emotional loss, especially if important friendships have been disrupted." We have received several emails from children discussing selfimmolation, etc., over VMK closing. We have encouraged these writers to talk with their parents or others who care about them regarding their feelings. Talk with your children who have been playing on VMK, just as you would if you were undergoing a painful move to another place. You will not "just know" how your child feels until you talk with them. Please take care of your children at this very difficult time. Thank you, Linda, for your insightful interview. We appreciate it. "Thank you for making this site and personally Disney needs a good kick in the pants. Walt would never aprove. I'm 82 years old and my father knew Walt, and had him over for dinner very often. Thank you again. Cheers, Aubrey"
Dawn Chmielewski and Alex Pham at the Los Angeles Times finally got an "on the record" quote from a Disney official, Steve Wadsworth, head of the Disney Internet Group, about why he thought VMK should be closed, from his keynote speech at the EconSM Conference, a conference about how to make money off of social networks. Thank you Kaitlin, we will be sending the petition (and signatures) to them, and encourage everyone to write to Disney at that email address, too!! Save VMK!!! "Isn't that truly the goal of Disney, to maintain the current level of Disney fans as well as to continue to create a new generation? ... Is the hope that VMK players will shift over to Club Penguin to play, which would increase Club Penguin�s statistics? Probably, but they are not the same type of gaming experience. "My thought is why couldn't Disney offer VMK as a pay-for-play type of gaming? ... Have it set up for a month as a trial run and inform all VMK members that they will offer it as a pay service. If they don�t enough people registered in the first month, then they can close it based on lack of interest. What happens though if thousands are willing to keep paying and keep it running? Then Disney would have two types of on-line gaming, a free service Club Penguin (although parts of it are a pay service), and a pay service, VMK. To me this seems like a reasonable idea. ... It appears that another alternative is needed and hopefully a pay-per-service, while not the best solution, is just the one that might save VMK!" This is an excellent point. As far as I know, Disney has not ever responded to this entirely reasonable suggestion. They have said they expect their online worlds to form a network of virtual worlds for various demographics knitted together; but what TV network, for instance, cancels a hit show to make room for a new one? Many feel that Merrifield is the key person responsible for closing VMK, outside of Sulake. "I think one of the biggest challenges is the irresponsible nature with which our industry has taken care of kids for a long time - so there's a great cynicism out there, and understandably so," Merrifield told GamesIndustry.biz. Mr. Merrifield, if you aren't the key person responsible for closing VMK, feel free to let us know. "Hi! I have a picture of our virtual protest. I don't remember all their titles but I'm the one in blue princess top (angelagt) and boy next to me is marko. Thanks to all who participated!" "Why is it that no one in any of the posts I have read has mentioned some sort of class action suit? To me it seems like a scam or fraud of some kind that happened. "If players and their families spent good money at the parks, on cruises and in hotel stays, expecting to get online items, where was it ever said that these items would be temporary? How many players and families would not have spent the money going to the parks and doing the quests, if they knew the items were only a promotion? How many would have booked Disney hotel rooms, rather then less expensive ones, if they knew that the prize they got for booking the room would be gone in less then 3 yrs. How about those that went on Disney Cruises, or booked thru a travel agent, just to get a stitch hat. "I don't understand, with all the players protesting, that no one has an attorney in the family or as a friend that could advise them on this. I have read all the protests, and the money that Disney could make if they made this site a pay to play. But no one mentions the fact it seems Disney has already made money off the players, through scamming and false promises. But even though Disney doesn't seem to be following the example of its founder, it doesn't mean there aren't wonderful people out there who are willing to work and sacrifice to make children, and their families, happy. Thanks to Andrew from Sun City also for his support! No thanks to Disney, who just list the same meaningless answers, then tell how everyone should just move over to their other games. Why would we do that, when it is obvious Disney does not value the trust we gave to them? Disney also seems to be saying that VMK players don't matter since Disney has soooo many other woooonnderful games out there. Why play -- or watch, or listen, or read, or visit -- anything from Disney when it's clear they'll pull the rug out from under us without so much as an honest response? "The Rainbow: VMK is a rainbow, and rainbows are beautiful. So me and my friends almost made a rainbow of all of us wearing certain colors. VMK_Mocha Visited. I was glad. "The Virtual Gate: A few of us blocked the Esplanade gates to show staff How it REALLY feels to have the virtual gates closed. I got banned, but it was worth it. "The Tiki Tiki : Another blockage, We blocked the Tiki Tiki south bridge. I did not get banned, but again, it was worth it. "I was really glad to be able to be a part of this. I am very proud to even send you this. I am uploading a VMK video soon on my Youtube. Also, thanks for all of the Info that you have put up. It's greatly apprecitated. "Ps: Again, Thanks :) :) :) :) :) :) :) :) :) :)"
t and sign up today! "This is such an awesome site! I will admit, I come here like every 10 minutes looking for news on VMK. I love VMK! It's like a second life to me. When I'm having a bad day at school, my only comfort is thinking I can go on VMK when i get home." And then she wrote, "Save VMK!" -- 11,259 times! Save VMK!! Does Disney "Get" Virtual Worlds? "So here's my takeaway. From the interview, its clear that Disney understands the business opportunity in Virtual Worlds & Social Networks... On the other hand, Disney's decision to shut down VMK demonstrates that perhaps they don't really get the "social" component. In these social environments, Disney's role is to provide the frameworks (architectural, security and creative) and the context, but the real content is created by the participants. In shutting down VMK, they aren't just closing an amusement park attraction. They are throwing away the work of the thousands of dedicated, passionate kids who have spent countless hours building and sharing wonderfully imaginative experiences, and in the process, will be alienating many of their most dedicated and influential advocates." Thanks to everyone who has written to me, and for your wonderful comments. I understand for many of us it is very upsetting that VMK might close. Some of us are so upset we are thinking about dying. If you are sad, please go talk to your parents, teachers or others you can trust. Don't wait, okay? Because your VMK friends want to help you too. Our world wouldn't be the same without you, and we care about you, and want to help. Things are always changing. And sometimes, it's hard. But remember that a lot of times, things get better! We are trying to do what we can with VMK, and we are happy to hear that there is a new site coming: Virtual Family Kingdom. You can use your VMK name and meet up with your friends there, no matter what. We have talked to the boss on the phone and he is really nice and trying to help all the kids out there that love VMK and want some place to go to be with our friends. We have been asked hundreds of times -- by major stock holders, and by the very young -- the same, excellent question over and over: "Why would Disney want to close VMK?" Some say, simply, Disney is being "greedy." They want more money any way they can get it, they say, and Disney appears to think few players will stay on VMK if they begin charging for it. Judging from hundreds of comments we've received, this is an incorrect notion. The players love and live for VMK, and some would gladly pay. Further, if Disney is simply being greedy, why is Disney throwing away a $2 billion project? Especially when that value for VMK is calculated upon Disney's own valuation formula? Here is the formula: Club Penguin had 700,000 players. Disney bought it in what could be a $700 million deal. Thus, Disney counts each ClubPenguin user as being worth $1,000 dollars. Disney assigned this value even though each player only pays between $58 - $72 per year to play. That adds up to about $50 million per year, which is what they reported making from ClubPenguin last year. This brings up another question: how will Disney make money on the ClubPenguin deal? Perhaps Disney expects ClubPenguin to keep all their players signed up until the yearly amount equals the purchase price -- in another 14 years. This appears highly unlikely given the pace of technology. Or, it could be that Disney hopes to recoup their investment selling ClubPenguin-brand products on the side. That doesn't seem very likely either. Finally, Disney could be hoping to make back their money by getting many, many more people to sign up for Club Penguin. How can they accomplish this? The comments we've received suggest that the amount of people who can see themselves as penguins may be a limited number. So, Disney could be hoping to increase their Club Penguin (and other virtual worlds') membership by closing down other, free parts of their web sites, in hopes players will sign up for paid Disney sites instead. That sounds feasible. So, while the Disney-is-being-greedy theory seems partially valid, it doesn't appear to be accurate or working. Disney remains focused on providing extraordinary quality within their brand. So maybe, as others say, Disney is just being "dumb." Look around VMK; the site has already lost it's many acquisition-minded players. Meanwhile, look at the other Disney virtual games: Are they suddenly busier? Overwhelmed with new players? Many say they are not. Further, many agree that visiting the Disney parks is not cheap. So whatever their expenses for running VMK -- estimated at under $850,000 per year -- Disney has a clear way to recoup them in full, and then some. Here is where things take a surprising turn. Also unlike Club Penguin, VMK doesn't have 700,000 players. Rather, VMK is said to have over 2 million registered players. Over. Two. Million. Players. And make no mistake, for many of these players, VMK is their primary entertainment, Internet and recreational avenue. They may have "Hannah Montana" playing in the background, but VMKers are leaning forward, focused on their real friends and real interactions within the virtual world of VMK. So, going by Disney's own valuation -- with each player being worth $1,000 a piece -- VMK is worth $2 billion dollars. That's billion, with a "b." Who would have thought Disney was doing so well that they could throw away a successful, growing, $2 billion dollar project? Meanwhile, every year, Disney avoids a potential $144 million dollars per year of profit, simply by not charging $6 per month to play VMK, which could, over time, push VMK to exceed it's $2 billion value, just as Disney expects ClubPenguin to surpass its $700 million value. So, given the brilliance that is VMK (and its revenue-generating potential), the Disney-is-being-dumb theory doesn't hold water, either. Which leaves one theory left. So Sulake appears to be playing the cards it was dealt wisely and carefully. Noted. After all, what does Sulake care about Disney? Or fans of the Disney brand? They're all just another client, as far as Sulake's concerned. And bonus points to Paramount for out-witting Disney (although they better be very careful in their own dealings with Sulake!). And why did Disney sponsor a virtual world -- where children were supposed to grow and develop their (and Disney's) presence, property, and social networks -- by contracting with Sulake for such a limited time? The 10-year olds playing VMK all knew VMK was supposed to go on forever, so why didn't anyone at Disney appear to know this too? Which leads back to the original question, one which, it turns out, no one but Disney can answer: "Why would Disney want to close VMK?" SaveVMK.com has a petition of over 16,460 people who would like to know. And it suggests another, yet-to-be-answered question: Why are the Disney stockholders standing by while such a tragic mistake is made if VMK were to be closed forever? The world may never know the answer. Or care, since other, non-Disney virtual worlds are likely to pick up that $2 billion value, while gaining the gratitude of millions of former VMK players and their families (formerly known as Disney customers) on May 22. Posters on several forums are speculating that this could indicate Disney is considering switching VMK to pay-to-play. Based on the comments we have gotten, VMK would be a great gateway for Disney to convert many of it's free Internet customers over to pay-for-play subscribers. Nate, Chan, Scott Morgan, William Spangler, Meg Penn, PrincessPixiePop, Andrea, and GeneralBirdman wrote to say they are boycotting Disney -- no longer buying any Disney products, or visiting the parks -- over their closing VMK. As FISHKars told Disney, "With this website probably already lots of people are going to boycotting Disney products. So to save your company, save VMK." And they are not alone!! According to Central Florida News 13, many parents across the country are starting to boycott all things Disney over the planned closing of VMK. Be sure to click on the "Video: Online Disney Dilemma" to watch the segment. Thanks very much to Shelly, Elaine, and William Amato for speaking out and standing up to Disney!! Share with your parents and friends how you feel, ask them to sign the petition, and together let's save VMK!! Previously, Mizmouse emailed about having a protest inside VMK. Many of you went to protest -- thank you!!! Mizmouse wrote, "Thanks for your help telling people about the first Save VMK Walk...we had a huge queue to get into the room...I will be organizing more of them in the future! We had hundreds show up for the Save VMK Walk today!" Cazz wrote with a great suggestion... Why not ask Dr. Phil to do a show on VMK closing, and how it is important to disabled and lonely kids who are trying to learn how to grow up by playing together on VMK?? Click here to contact Dr. Phil! Superpixkid wrote and told us: "i have told most of the teachers in my school about vmk and how its closing down then i asked about 7 teachers to sign the petition they all did and in a couple of weeks i will ask every body in the school to!!" Thanks, Superpixkid (and your teachers)!! What a great idea!! Thank you! SaveVMK.com: 100,000 page views lizzie_magic wrote to congratulate us all on getting 100,000 page views on this site. Thank you all for visiting! Save VMK!!! VMK gave 3,000 credits to everyone who logged on Tuesday, April 22. It sounds like a lot of players have stopped playing VMK, because they don't want to work any harder on something that Disney plans on just trashing. I think Disney hoped to move VMK players over to their other worlds, but a lot of the players may not trust Disney after this. Meanwhile, Virtual Family Kingdom has over 15,000 beta testers. Can't wait to see you there!! On Friday, April 18, my dad talked to Clifford Miller at Shamrock Holdings, which is Roy Disney's company. The company is the third largest shareholder of the Walt Disney Company. They talked for a long time and Mr. Miller asked my dad lots of questions. He told him to contact Bob Iger, head of Disney, and to tell Bob just the same things they had talked about. Mr. Miller suggested using email because he says Bob checks his email everyday. "I am Kenny. I am the father of two girls and the reason LOCAL6 aired their story. If there ever was a time to stand up in the face of a Corporate giant now is the time! Act now VMKers! It only took one phone call to get an interview on TV. I called on Friday afternoon to my local CBS Station and they came out on Monday the 14th of April to film our family taking a stand. Stand up for what you believe in. Do Not Delay! Now is the Time! We Can make a difference! "PS: Within 6 hrs of the story breaking on local6 the entire country had heard about it through websites like this." You heard him! Get your parents and get on that telephone! Call your local TV station, newspaper, and radio stations! Save VMK!! Update: Video for the news story is now available on the Local6 Orlando web site, and on YouTube! Great story!! Orlando's Local6 posted this story, which mentions our 11,000 signatures (so far)! ForeverWDW sent a link to an article in the Orange County Register. The Register is one of the nation's largest newspapers. The story includes an online poll. We encourage you to visit their site and vote now! Thanks to the OC Register for the mention and link to SaveVMK.com! And, thanks to ForeverWDW for the email. Save VMK! Here is a Google search for more news on VMK. A thread on the topic has started on Yahoo's Stock Message Boards. Anna wrote, "how do you save vmk?" I don't know for sure that we can. Disney people don't want to be forced, just like we don't like it either. So we are going to try to persuade the bosses at Disney that they underestimated how important VMK is to their audience -- and that's us! So please tell your family and friends to sign the petition (get your parent's permission first), and together WE will try to save VMK! Thank you for your support in working together to save VMK! Click the "View Signatures" page to see our current number of signatures. Your heart-felt comments are appreciated! SaveVMKtoday has a list of contact information to reach Disney directly. Thank you ! Tell your friends & family to Save VMK! We have called the head of a new virtual world and confirmed that will be opening on May 22. Virtual Family Kingdom is having their site finished and tested now (they started on the underlying technology a long time ago). It sounds like a wonderful experience traveling through history, playing fun games, making new friends, and preserving old ones -- including friends from VMK! Check it out at: Virtual Family Kingdom!